I spent the day yesterday, with my art buddies Pat and Benedicte, at the Central Park Zoo. It was a beautiful, but hot day, and every school class in the City was there for a field trip! 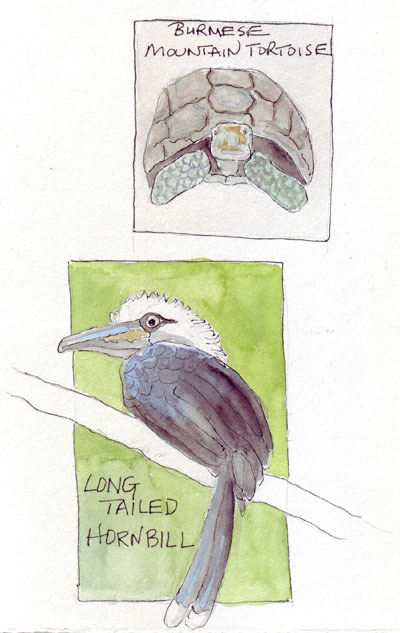 I love sketching at the zoo - it is a real test of how fast you can achieve an image of some type. 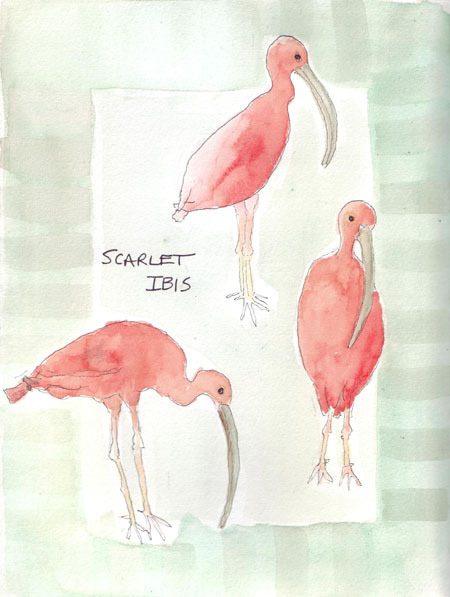 I sketch in pencil and then take a photo so I know how to paint the animal when I get home. These are the first 4 pages (out of 6) that I painted. 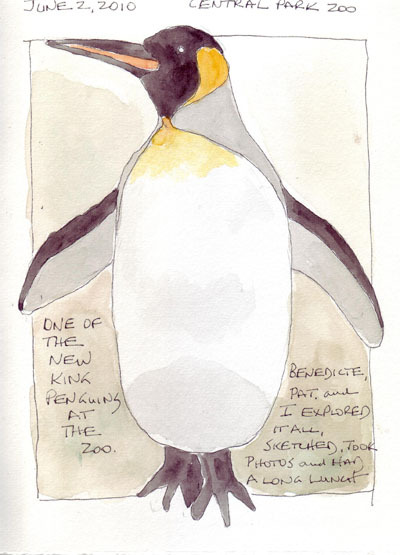 King Penguin - These are new penguins in the exhibit and they are bigger than the others. 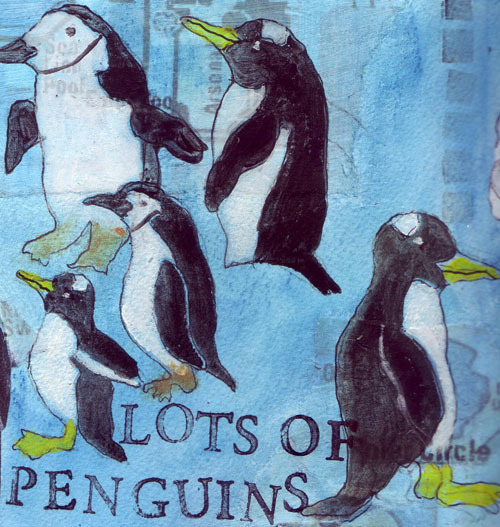 Our Journal Study Group is going to the Central Park Zoo to sketch on Wednesday, so I decided to play with my Neocolors II crayons and previous drawings of the Zoo penguins to get ready! 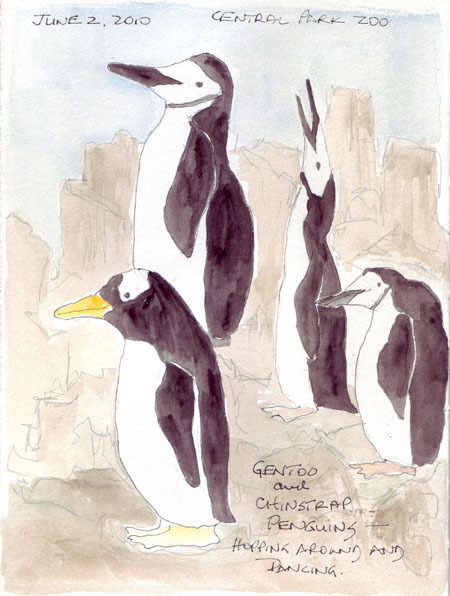 They have Gentoo and Chinstrap varieites which are drawn here. I had to use white and black acrylic paint, not my usual transparent watercolors, to paint these little guys over the crayon. We'll miss you Melly and Susan. Only one more day in May to post a daily sketchbook page! Yesterday my husband and I went to the Museum of Modern Art early to see the current Henri Cartier Bresson photography show and the Picasso print exhibit. This is the 3rd HCB exhibit I've seen and it was by far the largest - and included photos from many of his photojournalist articles in major publications. I really like his photographs, probably because they are such quick snapshots in the lives of people around the world. The Picasso exhibit has a few of the same prints that are in the big Picasso exhibit at the Metropolitan Museum of Art - but I never get tired of seeing his drawings, prints, and linocuts. 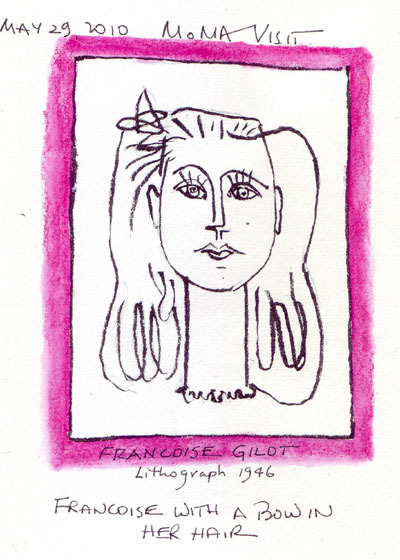 I remain fascinated with his ability to capture so much in so few lines and sketched his drawing of Francoise Gilot - I think hoping that I will achieve his skill through repitition! I still have to draw quickly in pencil before using the dreaded Pentel Pocket Brush Pen. My added color is from a Neocolor II crayon. The Whitney Museum was open around the clock for 3 days as their Biennial Exhibit draws to a close. It is usually very conceptual and not very interesting, but my friend Istar convinced me that this year there was art that would inspire both of us. So we went early yesterday morning and I really enjoyed seeing some of the work and I brought home a few ideas about things I'd like to try. This is the journal page on which I took some notes. There was one large room filled with only large ink paintings by Charles Ray. Each one was of flowers - that were very similar - but with variations on the compositions from painting to painting. There were many, many flowers in each painting- arranged beautifully. The colors were brilliant - and the flowers with the long petals, each a different bright color, flip-floping back and forth over each other, were my favorites. 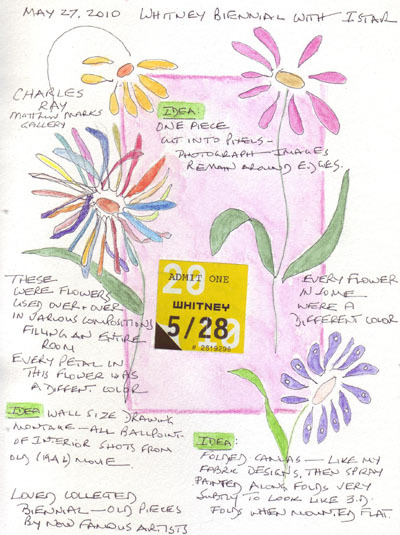 My journal flower sketches were each done in less than a minute - just enough for me to remember a few of the variations in his flowers. 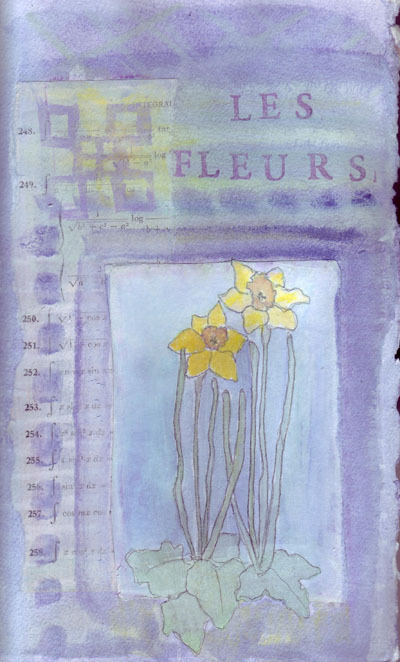 I used an image that I did several weeks ago at the Conservatory Garden in Central Park to make this design for a card.